Dorothea Lange’s images of the Depression’s unemployed and disenfranchised victims have long been acknowledged both for their power to prompt government action and their compassion. 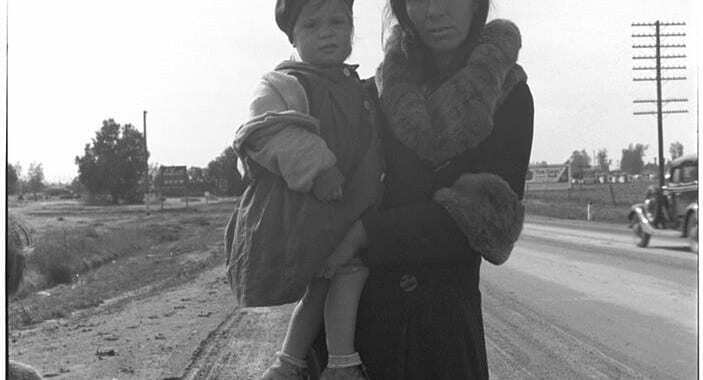 Lange was one of several photographers employed by the Resettlement Administration, which was later subsumed under the Farm Security Administration, who used documentary photography to chronicle the impact of the dust bowl, the mechanical tractor, the economic debacle and forced migration on the nation’s rural population. A documentary approach to photography provides the viewer with the necessary information to assess the situation (e.g. these are tenants thrown off their land) and, at the same time, appeals to his emotions. As William Stott has observed, “thirties documentary constantly addresses ‘you’ the ‘you’ who is we the audience… and begs us to identify, pity and participate.” 1 Lange’s job was to provide this visual evidence to both persuade and propagandize; the beaurocrats in Washington needed convincing and the necessity of Roosevelt’s social programs had to be sold to a largely skeptical general public. Lange went beyond the task at hand. More than her colleagues who tended to merely chronicle external conditions, Lange was an acute observer of the inner man. Attuned to facial expression and bodily gesture, she communicated poignantly how people respond to severe stress. By capturing such basic human emotions as loneliness, despair and hope, she transcended thirties America and created timeless statements about the human condition. Several sociological studies employed an approach similar to Lange’s in their exploration of unemployment. Clinch Calkin’s in Some Folks Won’t Work (1930) and James Mickel Williams in Human Aspects of Unemployment and Relief (1933) provided the reader with specific situations which could be applied to the general problem. 2 In accord with Lange, both probed the psychological and social consequences of being out-of-work. This methodology was used frequently during the Depression to insure that the public did not approach the problem in the abstract but felt it vicariously. Accompanying Lange’s acute psychological observations of human behavoir was her equally developed sense of photographic syntax. Her employment of camera angle shadows and cropping, indeed the entire structuring or choreographing of her image support her message. By analyzing or decoding them, it is clear that Lange employed a visual language which both enhances and creates meaning. Lange also made repeated use of certain symbols which the viewer could register subliminally, thereby reinforcing the image’s content. Thus, in Lange’s photography a fence is often not just a fence, to paraphrase Freud, but often a barrier which separates, excludes or traps. 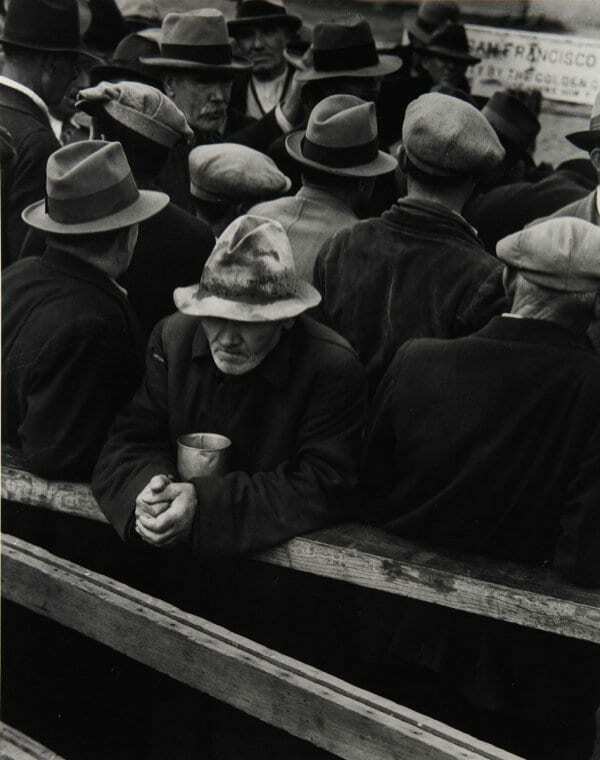 White Angel Breadline, taken in San Francisco in 1933, synthesizes the psychological, the formal and the symbolic. The man’s downcast facial expression, empty cup and rumpled clothing communicate his pathetic state. Originally based on a larger, more non-descript view, Lange crops the image and excludes all superfluous detail. The beggar is monumentalized and pushed to the picture surface, his hands both resigned and imploring extend to our space, intensifying the seriousness of his plight. His separation and anonymity create an “everyman” who we can identify with. Lange stresses the man’s isolation from the crowd by way of contrasts: the crowd is turned while he faces us, they seem relatively well-dressed hence newly unemployed, he is shabby and accustomed to poverty, they are agitated and waiting expectantly for something to happen, he is passive and detached. Despite our inital pull to him, the herding of the crowd also demands attention. The fence or barrier serves to humiliate both the individual and the mass, suggesting economic and psychological entrapment. At this opportune juncture she met the economist Paul Taylor who had researched the plight of Mexican migrants and was currently exploring self-help cooperatives in California. His academic expertise and her insight into people began a joint, life-long commitment to exposing the inequities of the economic system. Often Lange employed her language of symbols without recourse to gesture and facial expression. By employing selective vision, she could manipulate the setting to accord with her aims. Here the viewpoint Lange selects is crucial to our understanding of the black men’s humiliation and degradation while waiting for relief. They are seen acutely from above, rendering them both anonymous and small. The sweeping diagonal which slices the composition in half underscores their numbers, suggesting they, hence the problem continues interminably well out of the viewer s range. The fence works to partition them from the expensive cars which are beyond their awareness and economic reach. It implies a power dynamic in which they are lowly. But the fence also serves to group the men in geometric sections like so many dispensible units. Shadows echo their entrapment; each person is reduced to an amorphous silhouette separated at regular intervals by vertical black bars. Lange’s respect extends to the depiction of woman and minorities. This migratory laborer’s wife stands erect against the sky; her monumentality is enhanced by Lange’s cropping of the image. She is taking stock of her surroundings and speaking, as she clutches her head to fend off the sun’s searing rays, in a gesture which suggests strain and contemplation. Her perceptions seem as boundless as the sky. The caption which accompanied the original FSA photograph chronicles her plight in the arid Texas landscape. After recounting her family’s numerous hardships – no work in three months, forced to sell their car, barely saved from starvation by a generous sister – she ends rather matter-of-factly. “This country’s a hard country. They don’t help bury you… If you die, your dead that’s all.”13 She is accustomed to adversity but remains stoic because it’s the only way to survive. Often elderly black people are imbued with wisdom and forbearance perhaps because they have suffered the most intensely, first as slaves and now as sharecroppers. Lange and Taylor believed that in the Old South, the sharecropper replaced the slave afer the Civil War. After meeting this woman in the field, Lange visits her humble dwelling and records her contemplating on and relating her experiences. Like Rodin’s well-known sculpture which has become a symbol of the grappling of the human mind, Lange’s Mississippi sharecropper thinks not only with her head but her whole being. In another photograph of the same subject, Lange imbues the elderly sharecropper with an almost transcendent aura of spirituality. Hands clasped piously with eyes upturned toward God, Lange conveys that the way this woman is able to tolerate the harshness of her plight is to appeal to a higher power. This explains in part why religion assumed such a crucial role in the psychic survival of the black community. In this respect Lange concurred with Roy Stryker who later recalled, “I remember when Steinbeck came in ardloo at the pictures whose tragic beautiful faces were what inspired him to write The Grapes of Wrath. He caught in words everything the photographers were trying to say in pictures. Dignity versus despair. Maybe I’m a fool but I believe that dignity wins out.”15 Although Lange’s vision accords with the propaganda mission of the Roosevelt administration to chronicle conditions, never blame the victim and respect his dignity; her images are successful because she went a step further. By infusing her subjects with a bit of herself and relying on subliminal suggestion to bolster the message, she created some of the decade’s most memorable human documents. (New York: Oxford University Press, 1973), p. 28. Clinch Calkins, Some Folks Won’t Work (New York: Harcourt Brace and Co., 1930); James Mickel Williams, Human Aspects of Unemployment and Relief (North Carolina: The University of North Carolina Press, 1933). Lange to Roy Stryker, 23 March 1937, Stryker Collection, Oakland Museum. Dorothea Lange the Making of a Documentary Photographer, unpublished interview with Lange conducted by Suzanne Reiss, Bancroft Library, University of California, Berkeley, p. 147. Richard H. Pells, Radical Visions and American Dreams (New York: Harper and Row, 1973). 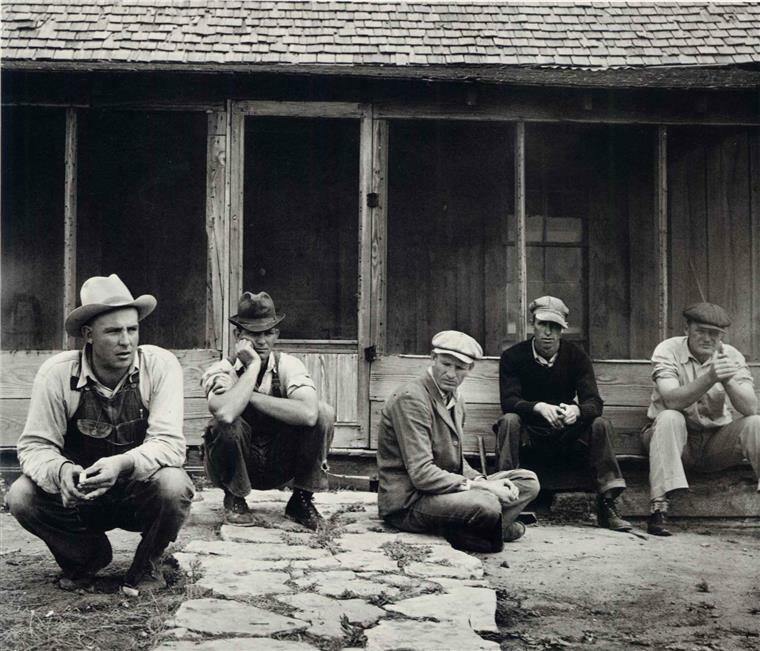 Dorothea Lange, the Making of a Documentary Photo­grapher, p. 157. Paul Taylor, Commonwealth Club Address, October 1935, quoted in Howard M. Levin and Katherine Northrup eds., Dorothea Lange Farm Security Administration Photographs, 1935-1939, vol. 1 (Glencoe, Illinois: The Text-Fiche Press, 1980. ), p. 53. 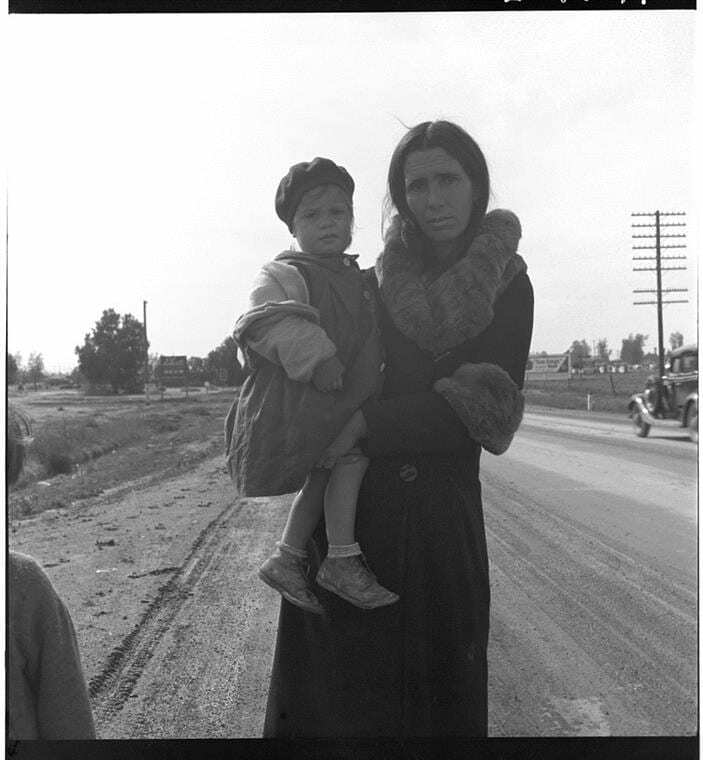 Dorothea Lange and Paul Taylor, An American Exodus (New York: Reyna1 & Hitchcock, 1939), p. 16. 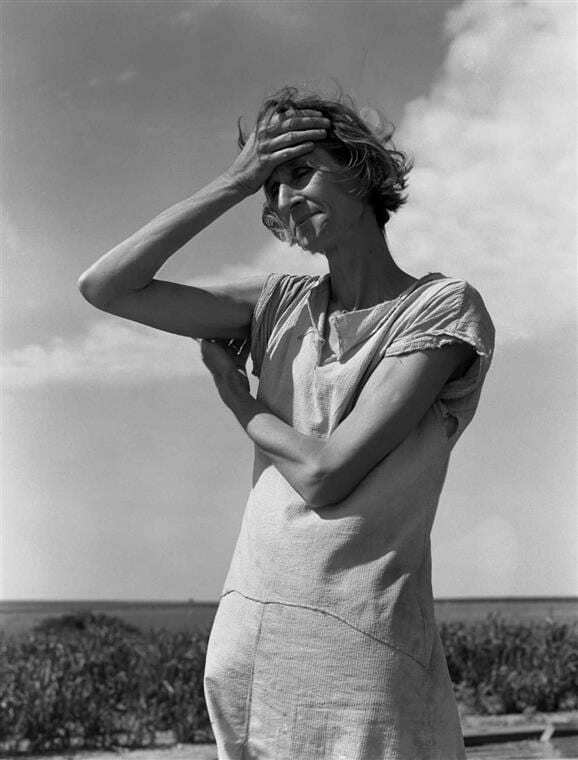 Dorothea Lange in interview conducted by Richard Doud, May 1964, Archives of American Art, n.p. Roy Emerson Stryker in Stryker and Nancy Wood, In This Proud Land (Greenwich, Conn., New York Graphic Society Ltd., 1973), p. 13. Quoted in Dorothea Lange Farm Security Administration Photo­graphs, pp. 197-8. Quoted in An American Exodus, p. 150. Roy Stryker in In This Proud Land, p. 14. 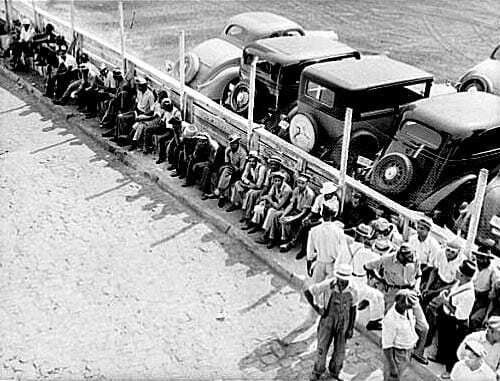 Posted in Essays, Highlights and tagged Dorothea Lange, Farm Security Administration, FSA, Merrill Schleier, Photography, Social Critique.